The Woolsey Fire burned for almost 2 weeks, killing 3 people and countless animals. Almost 300,000 people were evacuated from their homes and over 1600 structures were destroyed. 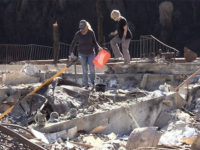 Now that the fire has subsided, the people of Malibu are coming together to rebuild their community.